The named characters are huddled around Weed in an attempt to give him some bodily warmth. Weed awakens. Minor Dog: Sorry, he had to die to give you the strength and resolve to fight on. Back at the battlefield, brown dogs fight each other. Finally, Akame reaches Gajou. Battle Message: The Ohu forces have retaken Gajou! Akame: With a minimum of screen time and noticeable effort, we have retaken Gajou! Battle Message: Hougen has appeared on the battlefield! Hougen: Break Level Limit! Increase power to Level 150! Battle Message: Weed has appeared on the battlefield! Hougen: Let’s settle this in the only sensible way possible- the good old one-on-one DW style duel. Weed: Agreed. Everyone, I want you to stand here and watch. Weed: Absorb Power of Friendship! Increase power to Level 99! Battouga! Hougen: How many times do I have to tell you not to keep using the same old trick? Weed: Thanks for warning me- Mode Switch! Lightning Attack! Weed begins a series of swift attacks on Hougen; Hougen is downed. Kyoushiro: Well done Weed, you’ve done it! GB: Are you sure? We’re only seven minutes into the episode. Hougen stirs, and gets up. Hougen: Gwakaka, that was just my third form! Begin Final Boss phase four! Gin arrives on the battlefield. Gin: Weed, you may be among the youngest and least experienced of the dogs here, but it is up to you to defeat Hougen by yourself. Weed absorbs the power of Father-Son bonding. Hougen: Such insignificant power will not be enough! Aeraga! Hougen grabs Weed by the tale and begins shaking him. Weed: Counter with Fang Crunch! Weed gets in a couple of hits on Hougen’s forehead, but it is not enough- in short order, Hougen tosses a broken and bloodied Weed on the snow. Hougen: MWAHAHAHA, I have won! That makes me the leader of all dogs in the world! Kyoushiro: Don’t be ridiculous- evil can’t win! Gin: I’m afraid we cannot intervene, as there’s no way to add us to the active party. Suddenly, the green spirits of dead dogs such as Smith and John appear to Weed. Smith: Weed, please take the ultimate power of Dog Souls! Weed absorbs the power and stand up. Hougen ducks, and the Battouga misses…or does it? A magical Aeraga wind of destiny blows Weed back, enabling the Battouga to land squarely on Hougen’s forehead. Other dogs: You’ve done it! Hougen’s HP must be zero by now! Hougen stirs, and stands up once again! Hougen: Don’t count me out just yet- I’m a very special type of final boss with no fewer than five separate forms! Gin: Weed, you have to finish him off. Weed: Father, I can’t, for I cannot abandon my pure-hearted image now! Gin: Yes, you are right- I instantly see your point of view. Son, you have surpassed me- which makes you the new Leader. Weed: Thanks, Dad, although I’ve effectively been the Leader for the entire series anyway. Hougen: Stop chatting! I’m still alive! Hougen climbs to the top of Gajou! Hougen: I am the Leader! A convenient lightning strike incinerates Hougen. Weed: Oh good, he died without my having to lift a finger and become a murderer. Gin: Looks like a happy ending all round. Flash forward to spring; everywhere is blooming and everyone is happy. Weed sits by himself in a field of flowers. Weed: Can the series really be ending so soon? I didn’t even get to have a girlfriend. Jerome: Don’t worry Weed, your story continues in the manga- all forty-one volumes of it. Weed: That’s a relief, then. Weeds friends approach, Weed happily goes to greet them. Could this be…the end? 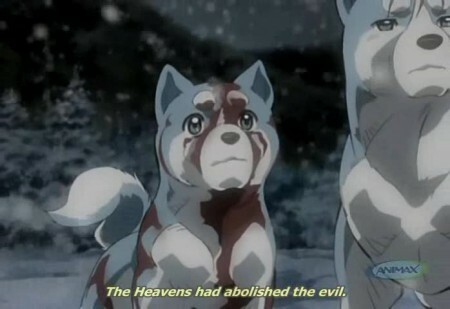 Many thanks to everyone who read and enjoyed these parodies; if you’d like to see me parody the prequel, Ginga Nagareboshi Gin, be sure to comment here. pleeease do this for GNG!!!!! The Gin parody never really worked out, but if you check my Tuesday Rumble posts you’ll see some short screencap parodies about Daisuke using his ‘bow’. i want to now more about this show im only 11 and ive been looking stuff up about weed and i already love it.is it on tv i hope it is but what you wrote is so funny. It has already been on TV…in Japan. The chances of this series ever being aired in the US are slim to none.